White Swan feathers as adhesive decals! This Body Art Tattoo you can do complete your White Swan or Swan styling.The white feathers of the Body Sticker Sets are richly decorated with glitter and rhinestones large, which makes them look very elegant.These adhesive tattoos are so perfect for your appearance as a beautiful swan or peace dove. 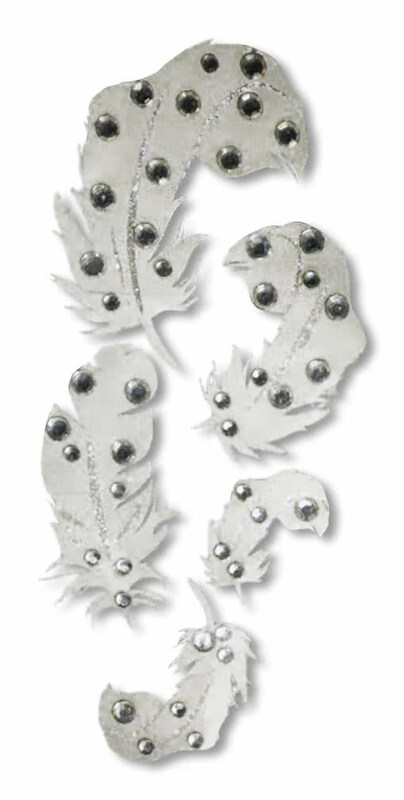 The Body Art Tattoo consists of five differently sized swan feathers, which are decorated with rhinestones and glitter.Is matched by our White Swan Make Up That your elegant look the finishing touches.If you carefully subtract the adhesive tattoo again, you can even use it multiple times by enabling it, if necessary with some Mastix Hautkleber klein Lock to.This Body Art Tattoo is a novelty from the USA and from theater and film no longer indispensable, because as soon normally you do not get perfect feathers on the skin. - Use only on clean, unadorned skin! - First you have to remove the transparent film on the back of the springs. - Regard, that the ends do not stick together, because you can separate these otherwise difficult again. - The sticker is very flexible, which promises a long and generous support of the Xotic Eyes. - Holding now the adhesive tattoo on the carrier film firmly and Place anywhere your body such.B.Arms or back. - When the sticker is correctly, press it gently on the skin, so that you can peel off the film.